The most common and inexpensive gas laser, the helium-neon laser is usually constructed to operate in the red at 632.8 nm. It can also be constructed to produce laser action in the green at 543.5 nm and in the infrared at 1523 nm. 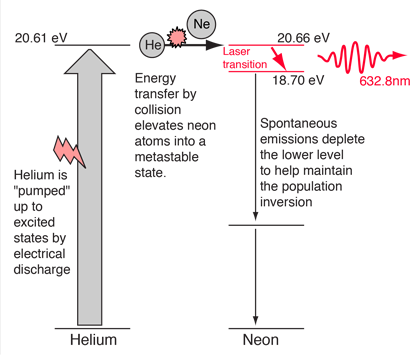 One of the excited levels of helium at 20.61 eV is very close to a level in neon at 20.66 eV, so close in fact that upon collision of a helium and a neon atom, the energy can be transferred from the helium to the neon atom. Helium-neon lasers are common in the introductory physics laboratories, but they can still be dangerous! According to Garmire, an unfocused 1-mW HeNe laser has a brightness equal to sunshine on a clear day (0.1 watt/cm2) and is just as dangerous to stare at directly. This shows the beams from two helium-neon lasers passing through two lenses arranged in the Galilean telescope geometry. The beams were made visible with a spray can of artificial smoke. The carbon dioxide gas laser is capable of continuous output powers above 10 kilowatts. It is also capable of extremely high power pulse operation. It exhibits laser action at several infrared frequencies but none in the visible. Operating in a manner similar to the helium-neon laser, it employs an electric discharge for pumping, using a percentage of nitrogen gas as a pumping gas. The CO2 laser is the most efficient laser, capable of operating at more than 30% efficiency. That's a lot more efficient than an ordinary incandescent light bulb at producing visible light (about 90% of the output of a lightbulb filament is invisible). The carbon dioxide laser finds many applications in industry, particularly for welding and cutting. The argon ion laser can be operated as a continuous gas laser at about 25 different wavelengths in the visible between 408.9 and 686.1nm, but is best known for its most efficient transitions in the green at 488 nm and 514.5 nm. Operating at much higher powers than the helium-neon gas laser, it is not uncommon to achieve 30 to 100 watts of continuous power using several transitions. This output is produced in a hot plasma and takes extremely high power, typically 9 to 12 kW, so these are large and expensive devices.